This article is about the European card game. For other uses, see Napoleon (disambiguation). Napoleon or Nap is a straightforward trick-taking game in which players receive five cards each; whoever bids the highest number of tricks chooses trumps and tries to win at least their bidden number of tricks. It is a simplified relative of Euchre, and has many variations throughout Northern Europe. The game has been popular in England for 200 years and has given the language a slang expression, "to go nap", meaning to take five of anything. It may be less popular now than it was, but it is still played in some parts of southern England and in Strathclyde. Despite its title and allusions, it is not recorded before the last third of the nineteenth century, and may have been first named after Napoleon III. The old game of Napoleon consists simply of five cards dealt out singly with the various players bidding in their turn how many tricks they think they can make. The player to the dealer's left has the privilege of bidding first, and then every player after him may bid up to the limit, Napoleon, which is a declaration to take all five tricks. Whoever bids highest leads first, the card led determining the trump for that round, and the winner of the trick then leads to the next. 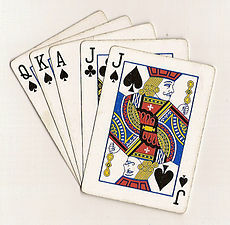 The cards are not gathered or packed together, but left face upwards on the table in front of their owners, except for the winning card, which must be kept turned face down on the table. This is the simplest form of Napoleon, requiring only that the players judge the value of their hands regarding the number of players and any bid that may have been previously made. Nap is best for four to five players using a stripped pack from 28 to 52 cards. If four play, 28 to 32 cards are used, if five, 36 to 40 cards. When six play the dealer deals himself no hand, but pays or receives the same as the other players. The cards in each suit rank from high to low (ace high). The dealer deals five cards to each player. Deal and play are clockwise, and the turn to deal passes to the left after each hand. The players cut to determine the dealer for the first deal. The player with the lowest card deals first. The ace ranks below the two. After the shuffle, the pack is cut by the player at the dealer's right. The cut must leave at least four cards in each packet. Each player receives five cards, dealt in a round of three at a time, followed by a round of two at a time. The bidding starts with the player to dealer's left, and goes clockwise round to end with the dealer. Each player is allowed only one bid and it must be higher than the preceding bid (or a pass). The high bidder makes the opening lead, and the suit of this lead becomes trump. The hands are played out in tricks with clockwise rotation. A player must follow the suit led if able. If unable to follow led suit, any card may be played. A trick is won by the highest trump card in it; if no trump is in the trick the highest card of the suit led wins. The winner of the trick leads for the next trick. Less than 5: Bidder wins 1 for each trick from every player, or pays 1 for each trick to every player if he loses. Nap: Bidder wins 10 from every player, or loses 5 to every player. Thus, playing Nap against 4 players, the bidder would win 40 chips (10 from every player), or lose 20 chips (the bidder pays 5 to every player). Failure to follow suit to the lead when able is called a "revoke". A revoking bidder must pay all opponents as though he had lost. A revoking player must pay the bidder the full amount he would have collected had he won. In the last case, the other opponents pay nothing. In every case, play is abandoned and settlement is made at once. Two - A bid to win two tricks. A joker may be added, counting as the highest trump, or in "Mis", as the only trump. Players bet 1 chip each deal in a cumulative pot. The first to bid and win 5 tricks takes the pot. After each player receives five cards, the next card is taken to be a floater. Players other than the dealer must bet 1 chip to look at the floater. Players can make bids with or without the floater (without is a higher bid than with). Mis, Misère, or Mysery is a bid to lose every trick. It ranks between three and four in the bidding. At Misère, an adaptation from Solo Whist, there is no trump suit. The principle is that the bidder has to lose the whole five tricks, while his opponents make it their business to force the player to take a trick. At some tables, trumps are recognized, determined in the usual way by the initial lead. However, this feature has doubtless been imported by players unacquainted with the original Misère and the method of playing it. Wellington is when the bidder undertakes to win all five tricks. The bidder must lead with his lowest value trump card when bidding Wellington. The stakes, if he loses, are double what they are in Napoleon. Wellington can only be bid if another player has already bid Nap. It was introduced into the game by "card-sharpers", who, working in collusion, used it to systematically overcall "Mr. Jugging's" Naps, and the unconscious "Mr. Jugging", attracted by the pleasing novelty, introduced this modality among his friends. Blücher is a bid to win all five tricks. It can only be bid after another player has bid Wellington. Sir Garnet consists of a hand in excess of five cards, dealt in the usual way and left on the table. Until this extra hand is appropriated, each player, when it is his turn to bid, has the privilege of taking it up and combining it with his own hand. From the ten cards in his possession, he then discards five, throwing them away face downwards, and on the remaining five he is bound to declare Napoleon. It consists of one extra card dealt face downwards on the table, and each player, on his turn to bid, may at his option have a private peep at the card by paying one Penny, or chip, to the pool. When all the players have bid, the superior declaring hand has the privilege, if he has "peeped", of exchanging the table card for one of his own. In the event of a Nap call, it is a rule to the advantage of the following players to peep also, as, if the bidder uses the peep card, they have thereby a guide as to what suit to save. Arguably the most interesting form of Napoleon. After the deal, and before any bid, the dealer goes round and serves out fresh cards from the pack in exchange of as many cards as the players wish to throw away from their original hands. For every fresh card, the players pay one chip to the pool. They must not exchange cards more than once in each round, but they can either refuse to buy any quantity up to five. The cards thrown away are not shown and are not used again till the next deal. In view of the extra cards brought into the game, Ecarté Nap should be confined to a table of no more than four players, and for the same reason the bids should be made on much stronger hands than the ordinary Nap. Each player receives seven cards. There is no exchange of cards and no peep. Bids of Wellington and Blücher are not permitted. The players may bid anything from three up to the lot (seven tricks). Misère is played at Seven-card Nap and ranks as next highest bid to Nap. Three = stake of 3. Four = stake of 4. Nap = stake of 10. Misère = stake of 10. Six = stake of 18. Seven = stake of 24. Misère: Bidder wins 3 from every player. Wellington: Bidder wins 10 from every player. Blücher: Bidder wins 10 from every player. Misère: Bidder pays 3 to every player. Wellington: Bidder pays 10 to every player. Blücher: The stakes are double what they are in Wellington. Bidder pays 20 to every player. Sir Garnet: The stakes are the same as on the ordinary Nap call. Ecarté Nap: At the same stakes it will be found to be more expensive than the latter game, but a great deal more interesting. Seven-card Nap: Players losing nap, misery, six, or seven pay half stakes. Wikisource has the text of the 1911 Encyclopædia Britannica article Napoleon. ^ Morehead, Albert H., Official Rules of Card Games Archived 2007-06-02 at the Wayback Machine, Fawcett Crest Books, New York, 1983. Ballantine Books by arrangement with the United States Playing Card Company. ISBN 0-449-21381-1. Pages 186–188. ^ a b Phillips, Hubert, The Pan Book of Card Games, Pan Books, London, 1960. ISBN 0-330-20175-1. Pages 268–269.